Tired of Xbox Enhanced games? Rather dust off your NES and play some classics? Look no more. 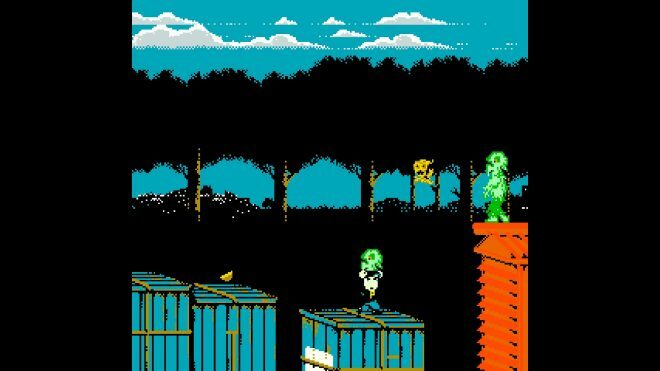 Haunted Halloween ’86 is so retro it even created a Nintendo cartridge that can be played on the original NES. A beat-em-up monster platformer, you will run through levels deciding what should be destroyed and what can be avoided. You can switch between two characters on a whim, though there is no redeeming value in doing this besides the choice of gender. Can nostalgia and horror make for a fun experience? 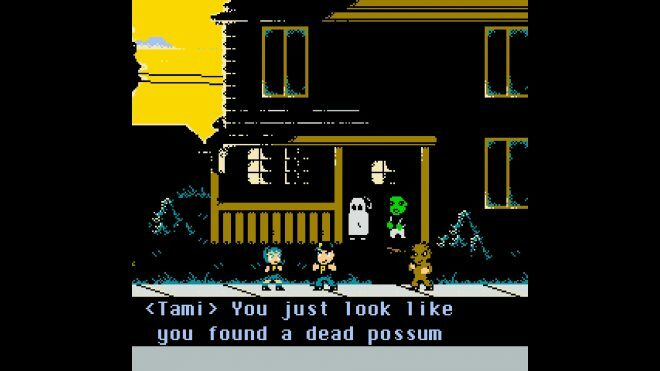 8-Bit Style – What Haunted Halloween ’86 does best is live up to the whole point of being an NES based title. With deep thumping, bad, yet charming tunes, you’ll relive the times you played similar titles such as Back to the Future. They even have a placed named after Biff. Homage to it’s inspirations is nestled quite nicely into the overall experience. Even if you don’t enjoy the game there is respect and appreciation that cannot be ignored. Achievements– If you’d like to pad your gamerscore quickly, you can pick up a completion within an hour of playtime. You won’t even have to beat much of the game, as all of the points can be obtained in the first moments of your playthrough. Not everyone loves to gain achievements, but those who do will fall in love with the idea of easily earned points. Hate the game? At least you got something out of it! Next Level – What happens when you die? You get to replay the area you faced the reaper. 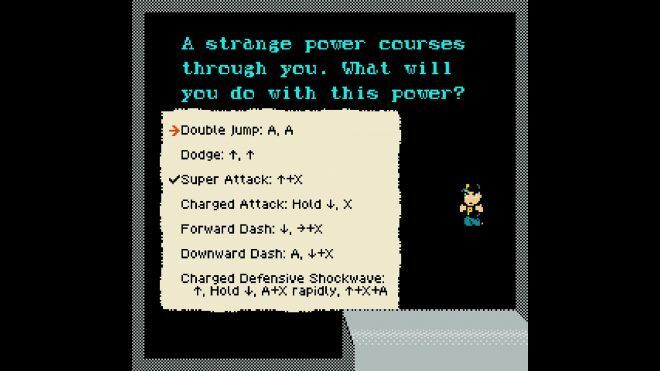 After beating the boss of a level, you get a code similar to how video games used to let you continue your progress. While many areas are challenging and somewhat annoying, being given the gift of multiple attempts can calm your frustrations a bit. Darkness – Most horror games and movies use dark environments to produce a scary atmosphere. The less you can see the tenser the situation. There are areas that are just black with a few hints of floor. This can create uncertainty of where you can jump or traverse. The lack of detail seems lazy versus providing 8-Bit terror. This could be fixed with better outlining or different shades of black, but instead, we are pushed into a dark closest of nonsense. No Analogue Support – With an attempt to keep things retro, you can only use the D-Pad to move. It takes some getting used to since you will by instinct rest your left thumb on the analog stick. Too many times I was wondering why I wasn’t moving before realizing my error. I get it, it’s supposed to be like a Nintendo game, but it’s just pretty tough to get used to something I never utilize by choice. Jumping – Pixel perfect jumping has always been the way of the classics. Timing and execution mean life or death. There is a serious issue where the game thinks you already used jump and makes your double jump activate right away sending you to your doom. This wasn’t the nostalgia I was looking for! There is also a move that lets you jump into the air punching. Perfect, I can slay those pesky crows that dive claw me from the sky! Only it almost never actually kills them. I’m not sure if this was a planned thing or just another letdown. There is nothing at all groundbreaking to be discovered here. You get what was advertised, a small adventure that should remind you of the NES days. It’s an admirable attempt with a clear love for the era, but you will likely not spend too much time playing it. Since the achievements are extremely easy, many may buy this just to grab them, however, unless you are a super fan of the nostalgic vibes this game is dropping, you are better off skipping this one. There are a lot of other games that can give you the same nostalgic feeling, while still adding new mechanics and creating a better overall experience. Haunted Halloween ’86 was developed and published by Retrotainment Games on Xbox One. It was released on August 24, 2018, for $9.99. A copy was provided by the publisher for review purposes.